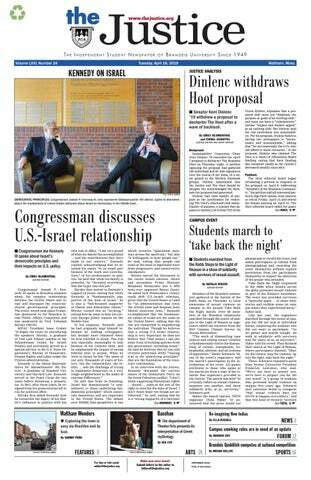 HAZARDOUS TERRITORY: Comedian Wes Hazard served up KVH certified jokes on Brandeis’ laughable Kosher dining options. REVIEW — This past Thursday evening, WBRS hosted its second comedy night this semester. Hosted by Josh Day, the event garnered a small, but lively audience. Dim lighting, as per request of Day — who spent time fussing over the Goldilocks “just right” setting for lighting — set the tone of the evening. A larger-than-life poster of a somber-looking pup against the wall behind the stage added to this facetiously melancholy set. To start off the evening, Day joked that this was his dog, who he recently put down, and that a reminder of one’s dead childhood dog is a necessary component for laughter at a comedy show. The morbid, edging on macabre, theme of the first joke would continue throughout the night. At the conclusion of his own jokes, Day introduced the next performer, Big Al David. David continued with the self-deprecating tone but focused on the hardships of his own old age. David tried — and mildly succeeded — to connect with the young audience with social media topics such as the frustration of others sneakily taking a snapchat video of you while you are just trying to have a fun night. David relied on a lot of shock humor, engaging the audience’s curiosity at how far he would venture into the improper with his humor. David finished his set with some rather perverted jokes about teenage male gymnasts. Following David’s edgy set was Danny Killea, the youngest of the comedians, who started off his routine with a light roast of Day and David. He moved into a bit about how renaming a “problem” as a “challenge” has positive implications for a drinking problem. A relatively new resident of Allston, Killea satirized the Boston spirit with a story about a 13-year-old who threw the opening pitch, Fenway Park, and the whole audience booed. In response, the 13-year-old flipped off the stadium. Killea also gave some sagelike advice — don’t talk to strangers on public transportation. Wes Hazard performed next, taking the stage after Killea’s Boston-focused bit. Hazard, it was clear, did his homework on Brandeis before the show. He opened with some comical statistics ridiculing the “diversity” of the Brandeis student body. He was the only comedian who rooted his jokes in Brandeisian culture, while the other comedians seemed to read the audience’s responses and adjust accordingly. Killea offered up jokes on the Kosher dining options, Brandeis parties and activities like Quiz Bowl. Killea’s comedic strategy resulted in a very different variety of jokes than the other performers, the latter leading to humor that, for most of Brandeis’ students, would likely be too far outside the range of political correctness to be acceptable. Killea’s comic style was very different than the other performers, including a multitude of rather long-winded stories. Although there were fewer punchlines than the traditional comedy routine, his admittance that he now bases his life-worth on his acceptance as a contestant on Jeopardy was quite endearing and entertaining. The advertised headliner, Tom Dustin, was saved for last. Dustin’s routine was in serious opposition to the current movement toward political correctness. He prefaced his routine by admitting that he “likes mean jokes.” Despite Dustin’s misgivings about performing at colleges where everyone is “too sensitive,” his act was a complete hit with the audience. Although some of his jokes came across as rather immature and cheap, the majority of his jokes were as clever as they were lewd. Every one of Dustin’s jokes roused laughter from the audience. He had an especially successful run on the topic of Bethany Hamilton (who is a victim of a shark attack), kids under pressure in the National Spelling Bee, and an Asian ex-girlfriend. Dustin’s humor, along with that of the previous four performers, was definitely targeted at a male audience. However, Dustin was able to engage some of the female audience members by calling them out for their reactions to his particularly male-targeted jokes. Overall, the comedy show proved to be amusing, as long as you were willing to go along with their particularly politically incorrect brand of humor. And if the comedy didn’t suit your tastes, at least the free pizza might’ve.